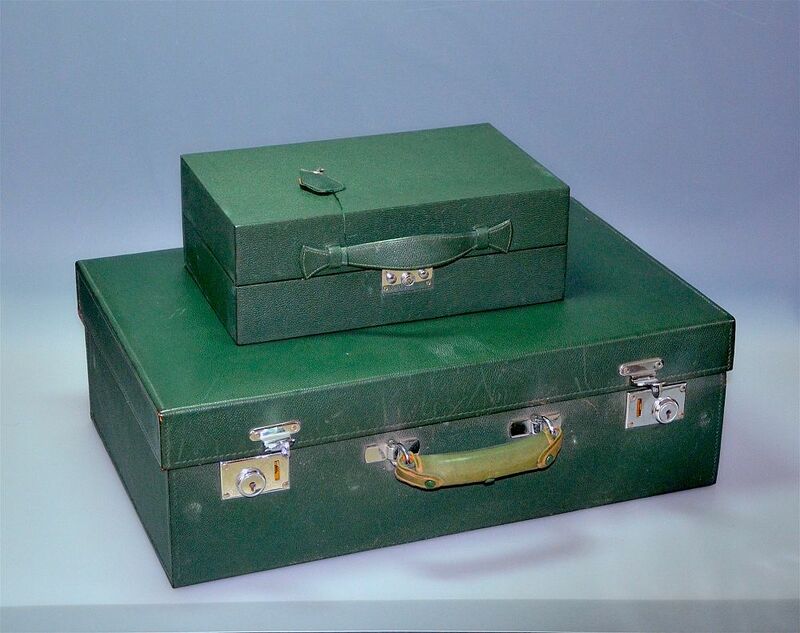 We were dumbfounded by this suitcase and contents because of its quality and condition and the fact that its interior is a little different from most of the suitcases that we have seen. 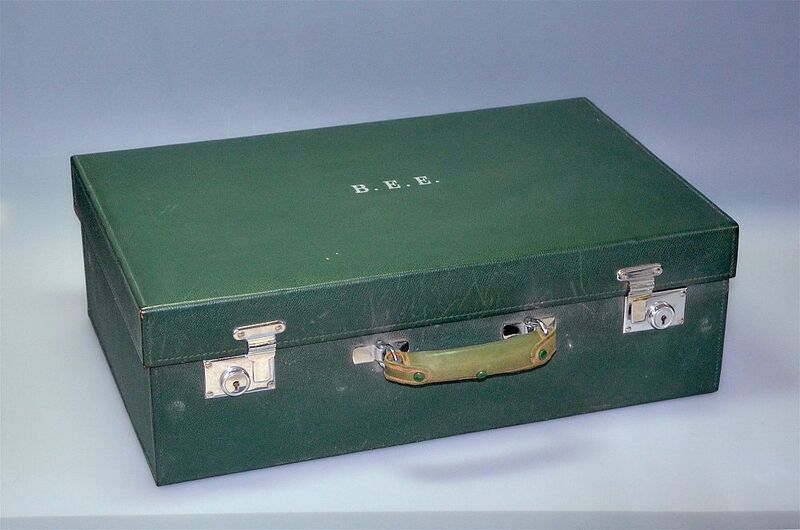 The suitcase has its original canvas dustcover with the Initials "B.E.E." embossed in silver. 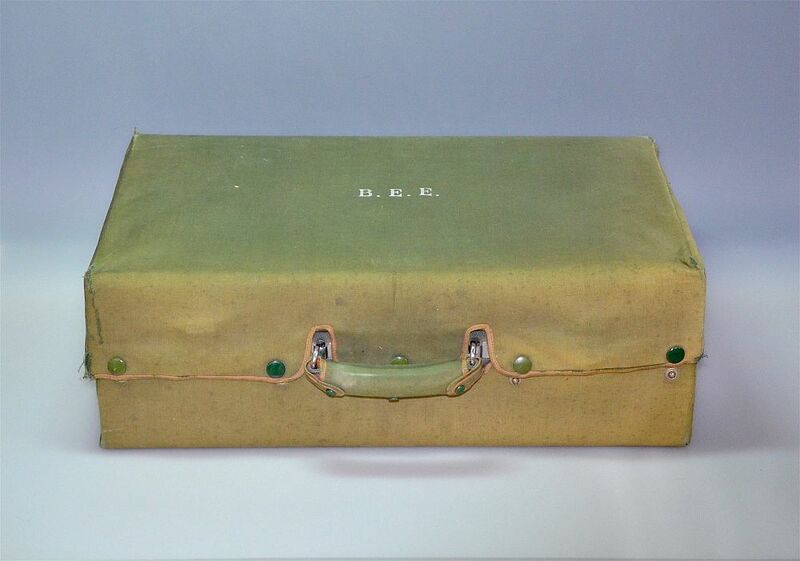 The green leather covered handle also has its original green canvas dustcover. 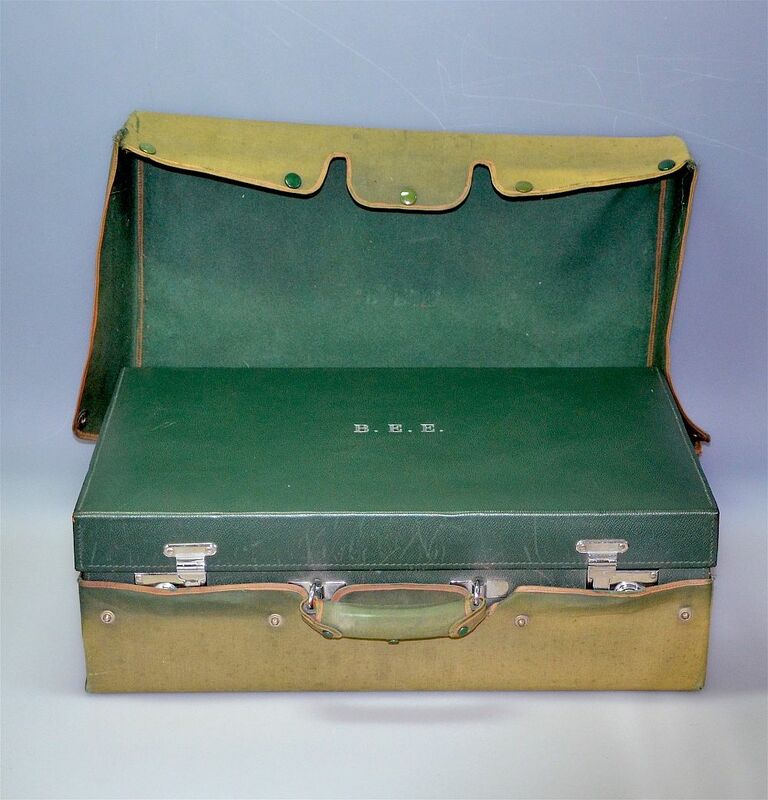 Removing the dustcover reveals the suitcase in all its glory of green leather again with the initials "B.E.E." 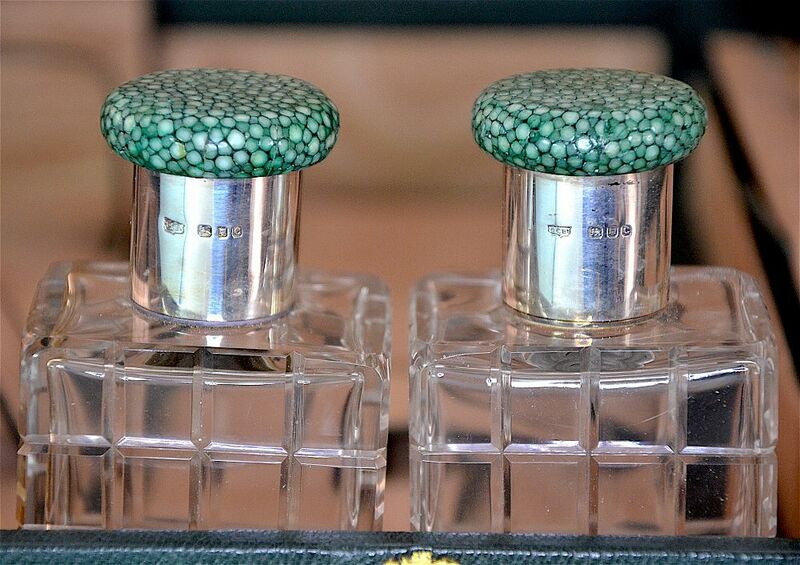 embossed in silver in the centre of the lid. Release the fasteners and take a peek inside! The suitcase is lined with beige taffeta moire and inside the lid are two elasticated pockets. 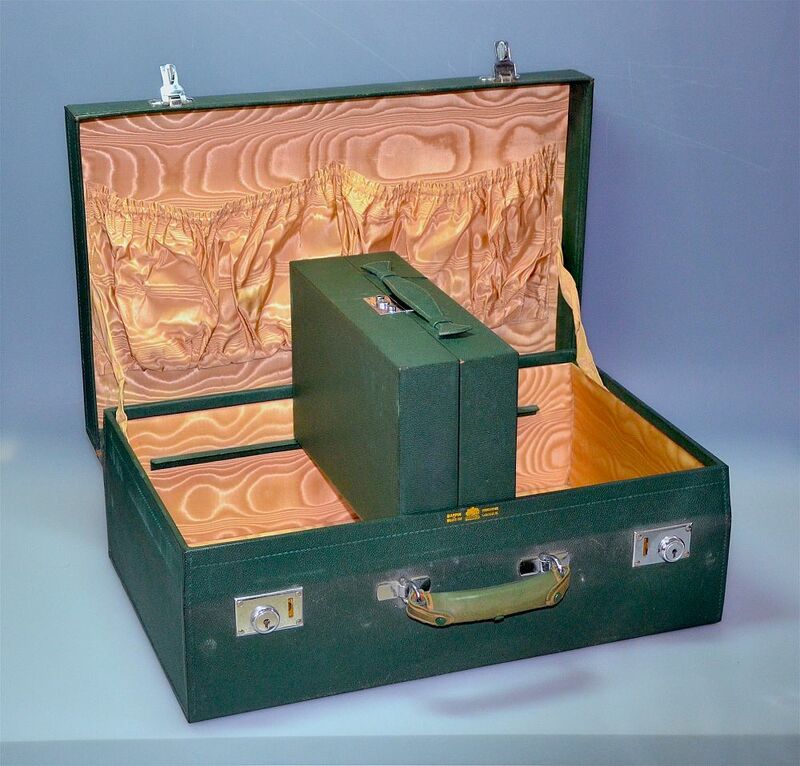 Inside the top of the suitcase is a green trimmed beige taffeta moire lined "tray". Viewed from the front of the suitcase, the "tray" has 3 sections. 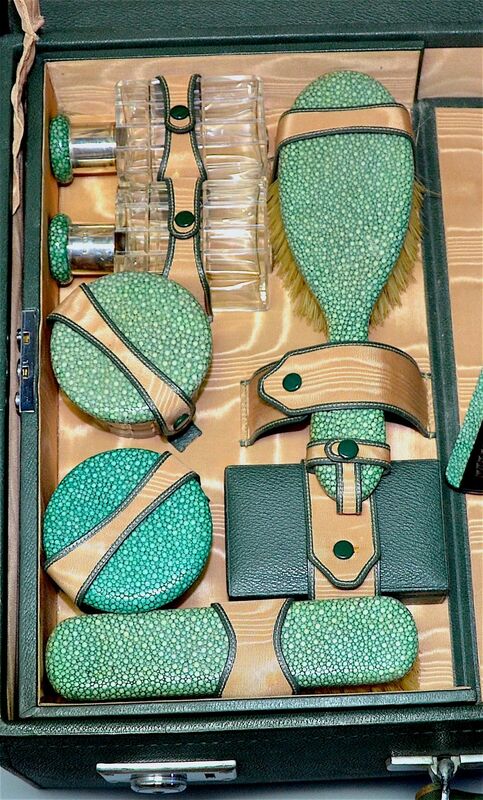 The left hand section has a hairbrush covered in green shagreen, 2 silver trimmed green shagreen topped cut glass bottles with stoppers, 2 round cut glass silver trimmed green shagreen topped pots, a green shagreen covered clothes brush and a small green leather box containing two keys for the suitcase with a green shield shaped leather cover. The silver trimmings on all the pieces is hallmarked by the London Assay Office for 1938 and bear the sponsor's mark "DCBs" in a broad shield shaped cartouche. All of these items are kept in place by green trimmed beige taffeta moire straps with press stud fasteners. 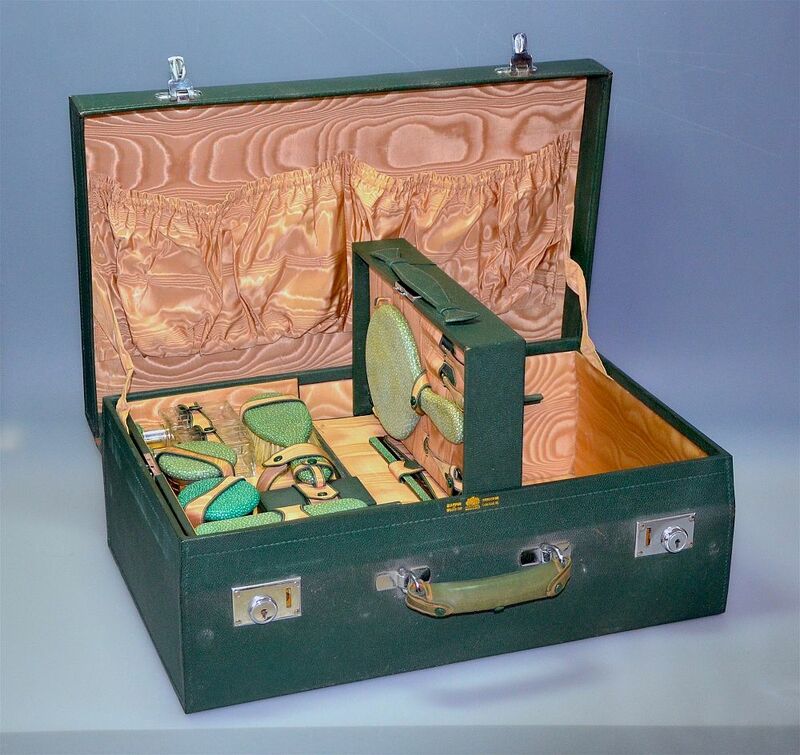 The middle section contains a tortoiseshell green shagreen topped comb strapped into a beige taffeta moire pocket by a green trimmed beige taffeta moire strap with press stud fasteners. 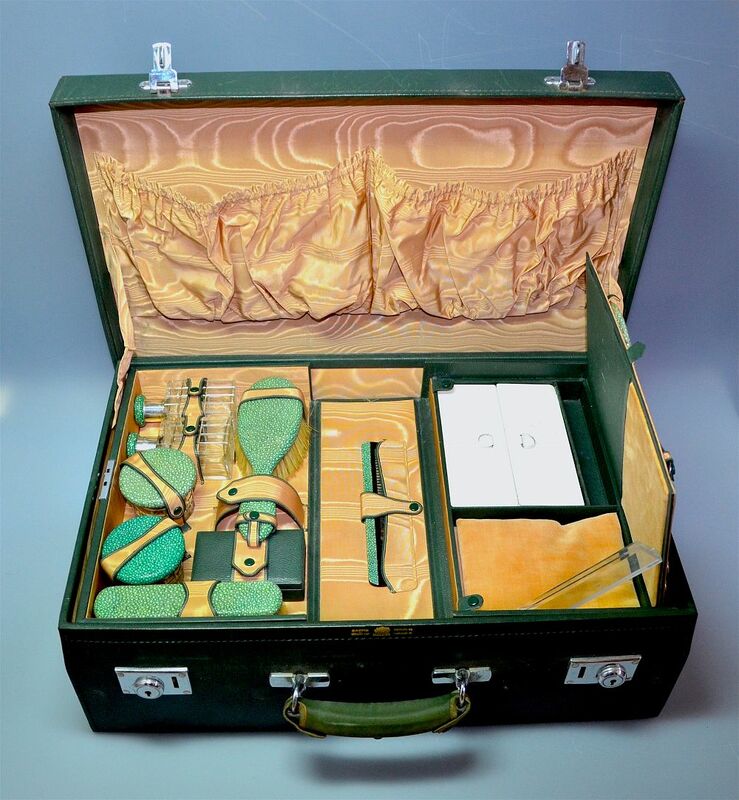 The righthand section contains a large round green shagreen covered bevelled glass mirror, a silver handled nail file, a silver handled nail cleaner and a chrome combined button hook and shoe horn. The silver handles are hallmarked by the Birmingham Assay office and hallmarked for 1919 and the shoehorn is stamped "Made in England". 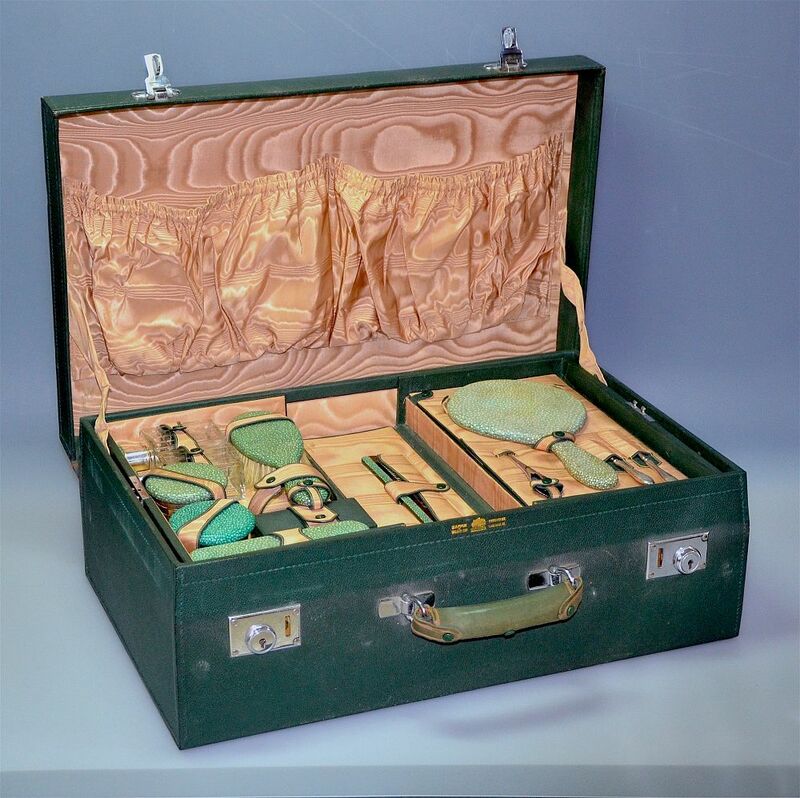 The mirror and shoehorn are held in place by green trimmed beirge taffeta moire straps with press stud fasteners and the other 2 pieces fit into green leather trimmed beige taffeta moire pockets. 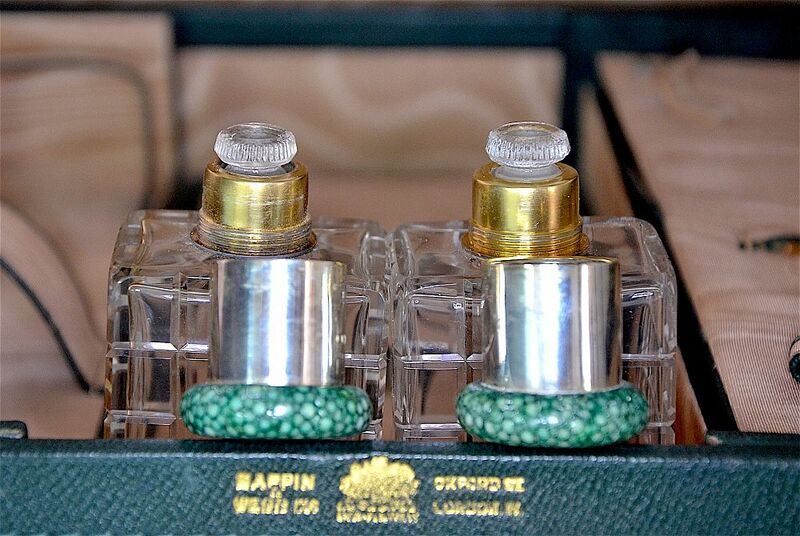 The right hand section pulls up to reveal a green lined compartment that houses a white enamelled metal double compartment box presumably for medicines and a beige velvet lined section with a removable beige velvet soft pad presumably for valuables/jewellery. 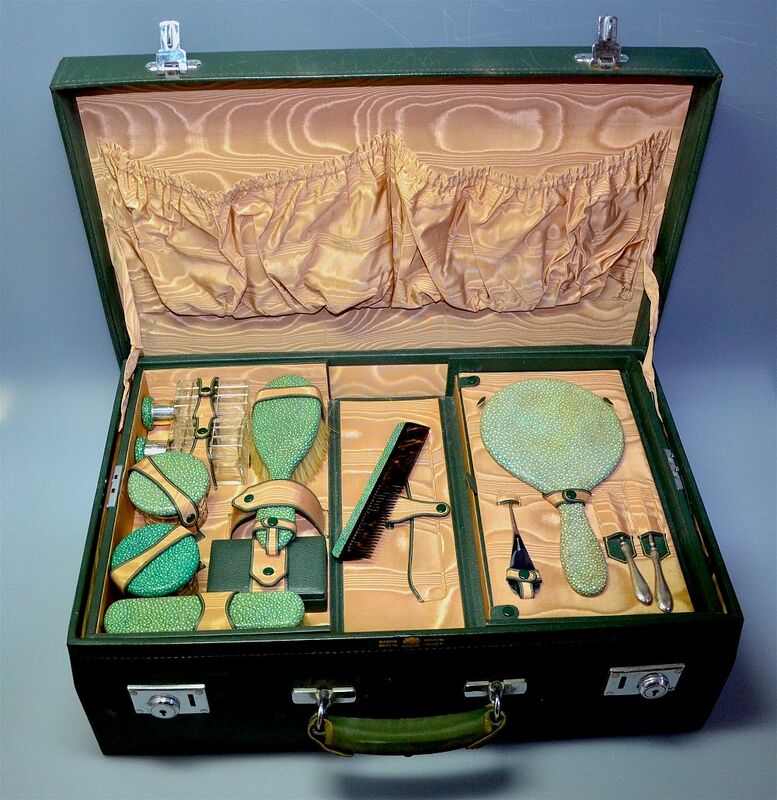 The whole tray is hinged on both sides of the middle section that holds the comb and folds up to form a small square green leather vanity case that can be locked and carried away. 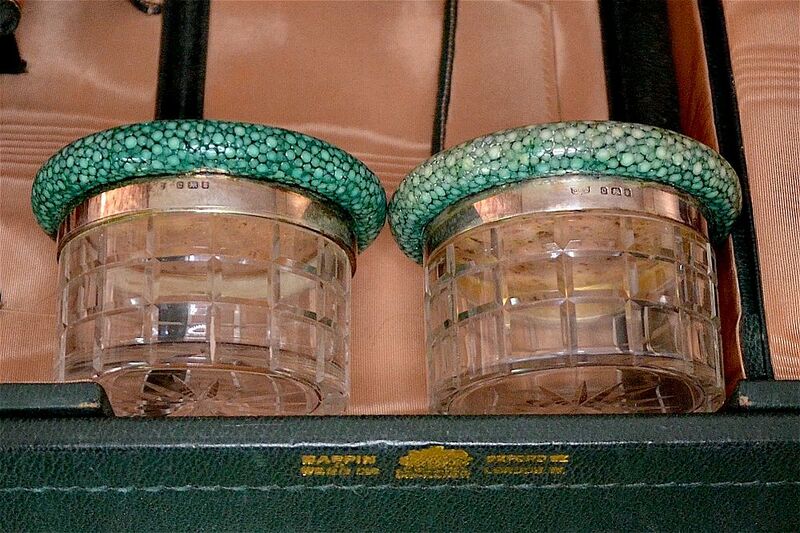 There are two keys for the vanity case in a green leather shield shaped cover. When the "tray" is removed, the rest of the beige taffeta moire lined suitcase is revealed. Embossed in gold on the front of the case above the handle are "Mappin & Webb Oxford Street London N" as well as an indecipherable motto and words.